Get ready for some SERIOUSLY exciting beauty news! Illamasqua could certainly be considered as the first brand to really embrace the blogger, as it were, with their incredible rise to worldwide fame and popularity being largely down to their relationship with online content creators and print media (and their sterling products don’t hurt, either). This week sees the launch of a first for any UK cosmetic brand, the #Creators Collection* – a limited edition selection of four products created by four top UK bloggers. 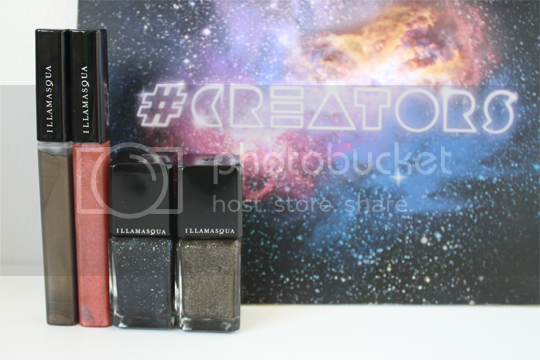 Not only is the whole premise of this collection super exciting, it feels particularly special for me because not only are Illamasqua my all-time favourite brand (come on, you know that) but two of the #Creators, Milly and Yinka, are good friends of mine who I have known for almost as long as I’ve been blogging. I am so stoked for all four of the #Creators for getting to be involved in such an amazing project, but especially proud of Yinka and Milly. Congratulations, girls! So, let’s take a look at the products then, shall we? This was my surprise favourite of the collection. As you probably know by now, I’m not a great lover of lipgloss but Milly’s beautiful Culminate lipgloss is something I am more than happy to make an exception for. A barely-there wash of colour with a leaning towards rose gold, with plenty of iridescent sparkle that transforms it into something special. Lovely stuff – and would work great layered over all manner of lipsticks, too. 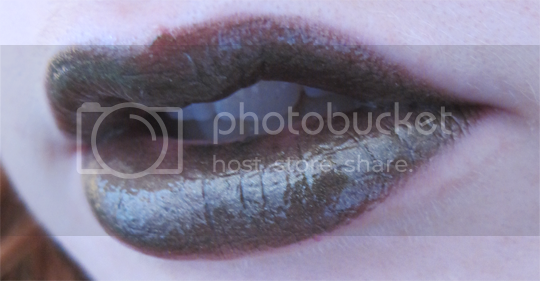 Munroe’s Intense Lipgloss was inspired y the ‘majestic beauty of oil on water’ – looks spot on to me. I feel like I should hate this on my skintone, but weirdly… I don’t. I’m not sure what it is that I love about it, but there’s definitely something. So much so in fact, that I think I’m going to have to plan out some Halloween makeup around this shade! This beautiful shade relects Yinka’s vision of the galaxy – dark, intense and mysterious. A perfect choice for Autumn Winter nails, Fusion is a one-coater with lots of interesting nuances and colour shifts when viewed from slightly different angles. Gorrrgeous. Suzi’s nail polish looks nothing short of incredible in the bottle – a strong shift of colour between deep purple and forest green shimmers, packed with a variety of different sized holographic glitter particles to create a texture ‘as unique as a star’. It takes a little patience and work to make the most of it on the nail, but it’s well worth the effort. The base colour is so richly pigmented that the glitter pieces can get a bit lost in it, not to mention building up the polish by itself can cause it to get a little chunky. I recommend applying just one thin coat of this over another shade (I used Illamasqua Baptiste, a deep purple shimmer) to release its full potential! The limited edition Illamasqua #Creators collection will launch in stores, on counters and online sometime this week – I predict a huge demand, so keep a close eye out for it! The Nail Varnishes will cost £14.50 and the Lipglosses are £14. A massive conngratulations to all the #Creators who took part in this fantastic collection, and just as big a thank you to Illamasqua for realising and embracing the power of the blogger! Which #Creators piece is catching your eye the most? Will you be picking anything up? Perseid and Wonderlust are INCREDIBLE!